woman, 55, red hair, is 5-foot-4 and 115 pounds. 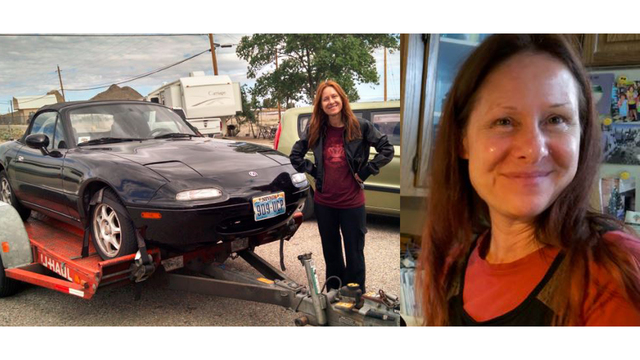 She drives a black 1996 Mazda Miata with Oregon plate 324-HPJ. Probably the most relevant thing is for all of us to keep our eyes open for the vehicle and go from there. maybe she went up Hunchback Mountain trail? A backpack has been found that her family believes is hers. Unfortunately, it was turned in at the ranger station back on 8/30. They don't have info on exactly where it was found or, I gather, exactly who turned it in, beyond that it was a mother and daughter. Obviously that would be really useful info to have, so they want to identify those people and talk to them. If this forum can get a lost wedding ring back its owner three months later, it seems like there's a real chance to turn up someone who remembers a pair like that mentioning finding a pack, hiking in the area, or just stopping in at the ranger station on 8/30. People who might not be following the news, or out-of-towners passing through on an extended Labor Day weekend.